The geographical area of Israel has been invaded, settled, occupied and liberated many times. Each invading culture brings its traditional foods. For some unknown reason, a plain cake with raisins and other dried fruits is known locally as English Cake. I never knew there was such a thing before I emigrated from the UK. Presumably it is an artefact from the British Mandate. The Ottoman empire left its mark with Burekas, savoury pastries that are filled with cheese, potato, mushroom or spinach. Each wave of immigrants brings its recipes. The polish immigrants brought Rugelach. Americans brought Pizza. Traditional foods have traditional shapes. Recently Angel, Israel’s largest bakery and rumoured to be the largest bakery in the Middle East, have started selling rectangular, machine-made pita bread, instead of the round handmade ones. Other than as a party novelty, they have not caught on. For nearly a century, Mazzot, the cardboard like unleavened Pesach bread (that is not to be passed over by anyone unless they have a particularly sensitive stomach) have been available in rectangular shape, made by machine. However traditionalists still prefer the hand made, round ones, at least for seder night. In August 2013, the Chief Rabbinate, concerned that people may inadvertently eat Biblically prohibited combinations of milk and meat without appropriate time gaps, have ruled that the triangle shape should be exclusively used for milky baked goods. See http://www.jpost.com/Jewish-World/Jewish-News/Rabbis-rule-on-shape-of-borekas and http://www.timesofisrael.com/rabbinate-regulates-burekas-shapes/ for more details. After intense negotiation, guidelines were drawn up and kosher bakeries undertook that henceforth the triangular shape would be used exclusively for milky products. Failure to observe these guidelines will automatically result in suspension of Kosher license from offending bakeries and patisseries. Since then, it has become impossible to find conventionally shaped hamentashen for Purim, apart from those based on a butter pastry or filled with crème-de-leche. Traditional hamentaschen, or Oznei Haman, as they are known in Hebrew, are filled with a black filling, typically poppy-seed. Prunes and dates are also sometimes used. In recent times, chocolate has also become a popular filling. Now many Kashrut observing Jews want triangular shaped non-dairy hamentaschen, that are traditional and may be eaten after a meat meal. There is also a custom of exchanging food gifts with friends, Mishloach Manot, that is mentioned in the book of Esther itself (Chapter 9 verse 22). The ultra-Orthodox rabbis have ruled that to avoid putting a stumbling block before a blind man, such food-gifts should be clearly meat, clearly dairy or clearly neither (parev). Unfortunately, the Rabbinate’s ruling that triangular baked foods are dairy has established a precedence that leads to ambiguity if not followed consistently, and only cheese filled hamentaschen or those with a butter pastry should be made in a triangular shape. 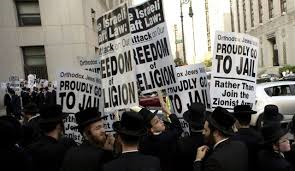 Whilst not following the Israeli rabbinic court, many ultra-Orthodox sects are aware that a new regulation instituted by a rabbinic court can only be overturned by a larger court that is also wiser. Since there is no larger court, they see themselves as stuck with this unpopular stringency. Consequently, in Jerusalem, Bnei Brak and Bet Shemesh, bakeries have refrained from making any hamentashen, not triangular ones or the new square variety. The dearth of triangular hamentaschen with black filling has caused large demonstrations. The Deputy Minister of Religion, Rabbi Eli Dahan has ruled that one can fulfil one’s obligation with rectangular hamentashen, however the Ultra-Orthodox doesn’t accept his authority. The Chief Rabbi, Rishon l’Zion Yosef notes that the triangular pastry in question developed in Germany and never took hold in Morrocco, Yemen or Tunisia, and that Sephardic Jews have no tradition to eat these foods. 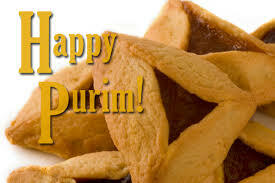 Consequently and due to the possible confusion of mixing meat and milk, hasmentaschen should be avoided over the Purim season. Not to be outdone, his Askenazi counterpart Rav Lau, who has to be at least as strict so that his authority is accepted, has ruled that even the square hamentaschen should be avoided. Degel HaTorah and Agudah have suggested that in the absence of the traditional pastries, people should, nevertheless, eat cakes and biscuits with black fillings like chocolate or poppy seed yeast cake. This position was dismissed by the LGBT community as being homophobic. Although some bakeries have tried rainbow coloured icing, it has not caught on with the wider public. The Finance Minister Yair Lapid, alleging religious coercion, has threatened to leave the coalition and bring down the government if traditional triangular hamentaschen are not readily available, and, in a populist move ordered that the price should be regulated to 32 NIS a kilo, so that they are affordable. Naftali Bennett of the Jewish Home party agrees with this principle but condemned the statement as price regulation came under his authority. John Kerry, visiting in Israel, was asked to comment. His vision of bakeries serving homentaschen, hot cross buns and croissants in peaceful coexistence was dismissed as Messianic by, Bugie Yaalon the Minister of Defence, who is considering imposing a state of emergency. UK Prime Minister David Cameroon, here on a visit, noted that PG-Tips teabags were tetragonal and filled with black tea, and thus could perhaps be a useful substitute. Foreign Minister Avigdor Liberman was overheard muttering that overseas dignitaries who didn’t understand the complexities of the Middle East shouldn’t get involved. Meanwhile, abstention from the traditional cakes seems to have triggered excess alcohol excess, with increased wine sales.